Here are pictures of John Entwistle's Basses when they were being auctioned off shortly after his death. They appear to have Series I electronics. I have no knowledge about any problem he might have had, but in a live setting, I suppose anything's possible. I thought I read somewhere that there was a problem with the power supply, but I really don't remember exactly. Didn't he switch basses, still have the problem, and then finally get it working? The thing that bugged me the most about the broadcast was the stupid VJs blabbering away trying to fill up the space and then still talking even though the band had started to play! John's alembic had an electrical problem before a Gig & as punishment to the bass he retired to the hardrock cafe wall of fame.......ive been looking all over for that thread but cant find it but it's a true story. It couldn't have been any of these Basses if that were the case. These at auction sold for quite a fortune. They were in the possession of his estate. I really dig that Macassar Ebony Flying V! I spoke with John very briefly about why he quit playing Alembics in '94 or '95, and he said it was all about switching from wood to graphite for stability. Not a word about one of them failing (which I hadn't known about until a couple of years ago on this board). The quote that's being cited here is from "Bass Culture-The John Entwistle Bass Collection", p 112. The quote is from the page facing the photo of the most famous Exploiter, also shown in the first auction picture above. It reads: "Alembic took two years to make the three basses for me. The other 4-string is in a Hard Rock somewhere. I sold it as its punishment for going wrong at the beginning of Live Aid". If you haven't got this book (still available at Amazon.com), you should definitely get it. It's not clear exactly which "three basses" he's talking about in this quote as there are nine Alembics in the chapter. I believe there are probably three 4-string cone-head Spyder/Exploiters - at least two wood-necked ones and one with a Modulus neck as well. There's also a split-headstock 4-string and a cone-head 8-string Exploiter. I'm fairly sure that there's a graphite-necked 8-string Exploiter as well. I visited Alembic when Jason Newsted was in Metallica and they were at their peak (the Black album). Alembic was just finishing a gigantic 10-string Series bass for him, with a super-quilted maple top that was dyed black because all their stage gear that year was either black or white. It even had black chrome hardware and black abalone inlay. If I remember correctly, Mica mentioned that Newsted was trying to have a bigger Alembic collection than John Entwistle, and this meant he needed something like 34 instruments. I've got Bass Culture and the Entwistle auction catalog as well and even though they are filled with amazing basses, there are a lot of pictures of him with other Alembics over the years as well. 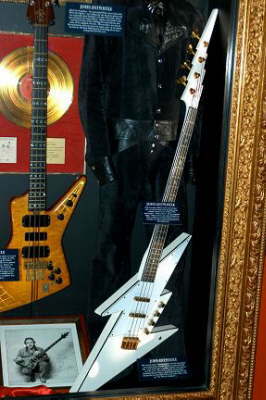 A friend of mine had a picture of this exiled Exploiter from the London Hard Rock, must have been in the mid 90s. Leland Sklar's double-neck Moonstone "Flying Turkey" bass (the one on the inside jacket of Jackson Brown's "Running on Empty" album, but who ever sees album art any more?) was also there at the same time. Taken from From the August 1989 Guitar Player..
At least he didn't do a "Pete Townsend" move on it. Personally, I would have just had it fixed. Thanks everyone. I knew this was the place to get the answers I was looking for. the original Spyder, John then No.1, was the bass that failed at Live Aid and indeed John sold this particular one out of frustration to the HRC. 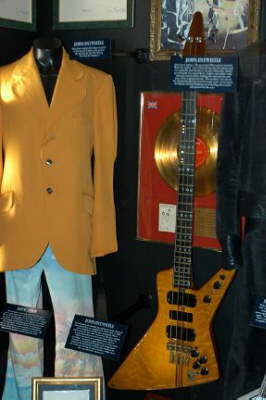 This bass was for several years displayed at the HRC in Berlin and after the enormous sums the other two Spyders brought at the auction the HRC shipped No.1 to the States, displayed besides the Peter Cook Thunderbolt bass at the Orlando vault. Cone peghead 8strings: 2, maybe three. One with a wooden neck, one with a graphite neck but I think that there was another one. Curious where there 8strings are today. John has sold and auctioned off many instruments over the years, many to be seen in old auction catalogues. Question:...where is No.2 (the smashed one) did it get tossed/repaired? what it a accident? what ever became of it?.....& please don't tell me it suffered a PETE TOWNSEND SMASH! You can read about it in old interviews but nothing further. BUT: it could be that I am allowed to meet the Who backstage this year during their Germany gig. This possibly beeing arranged by the longtime WHO and JE guitar tech. Oliver, what is the white bass in the middle of the photo you posted? that is wild! 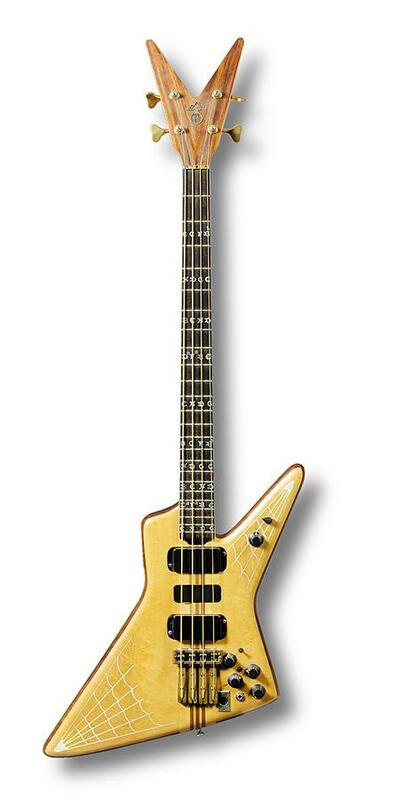 this is the Peter Cook Lightning Bolt bass. Buildt by english luthier Peter Cook after Johns idea on the cover of Who by Numbers. Currently beeing re-buildt by Ed Roman for the John Entwistle Foundation. Below pic of the original bass, courtesy RSG. Thanks, Oliver. Cool bass. I really dig the headstock!